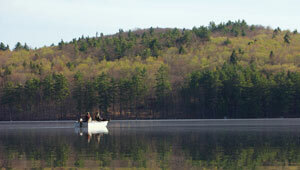 Community members know the Sebago Lake Region is a wonderful place to live, work, and play. Highlighting the special features that make this so, and that support the region's prosperity, is critical to growing a healthy environment and economy. The Sebago Lake Region Community Greenprint identifies the places and resources most important to the quality of life shared by the Maine communities of Bridgton, Casco, Denmark, Harrison, Naples, Raymond, and Sebago. Local leaders of the seven Lake Region communities recently set priorities for open space and natural resource protection, resulting in a Greenprint designed to help guide regional conservation efforts and land use. This project was made possible with generous support from local governments and private donors. Each city contributed $1 per person (based on the 2000 census data) toward the planning process. Private supporters include the Environmental Funders Network, the Elmina B. Sewall Foundation, the Horizon Foundation, the Maine Community Foundation, the Betterment Fund, and the Davis Conservation Foundation. To access the interactive Lake Region maps, contact Loon Echo Land Trust at (207) 647-4352 or info@lelt.org for a user name and password.